NINJA-K #11 Vaults Headfirst into a New Mission on September 12th! 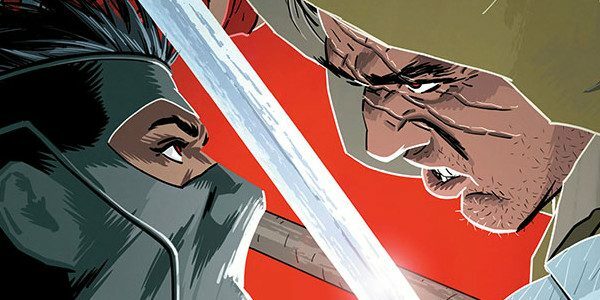 As first released on Comics Bulletin, Valiant is proud to present a complete lettered preview of a brand-new jumping-on point for the publisher’s explosive super-spy series, NINJA-K #11! Incendiary artist Roberto de la Torre (THE DEATH-DEFYING DOCTOR MIRAGE) joins acclaimed writer Christos Gage (Netflix’s Daredevil) on an immortal manhunt in part one of “FALLOUT,” as Colin King faces off against the unmatched strength of his former teammate: the Eternal Warrior! On September 12th, fist meets steel for a no-holds-barred knockout in NINJA-K #11– featuring covers by Kano (QUANTUM AND WOODY! ), Leo Colapietro (Van Helsing Vs. Frankenstein), and Roberto de la Torre (Captain America)!